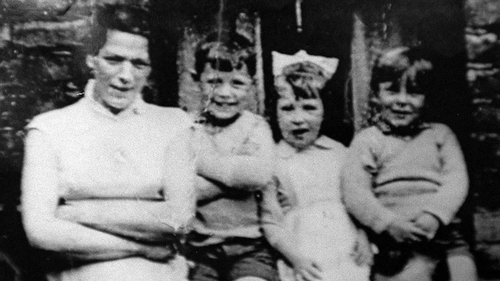 The eldest daughter of IRA murder victim Jean McConville has said she is prepared to name the people responsible for her mother's death. Forty-two years after the mother-of-ten was abducted from her flat in west Belfast, Helen McKendry said she no longer feared reprisals by republicans. "What are they going to do to me? They have done so much to me in the last 42 years," she told BBC 2's Newsnight programme. "Are they going to come and put a bullet in my head? Well they know where I live." She spoke out as Sinn Féin leader Gerry Adams was facing a second day of questioning by police over one of the most notorious unsolved killings of the Troubles. Her declared willingness to speak out was in contrast to her brother, Michael McConville, who said earlier that he was still not prepared to name those involved even though he knew who they were, because of the consequences for his family. "Everybody thinks that the IRA has gone away but they have not. If we tell we will be shot," he said. Mrs McKendry however said that she had the backing of her own children for what she was doing. "Anything that I can give to catch the people who killed my mother, I will do it," she said. "If anything happens to me, I will have five children who will carry on campaigning for the truth." Mrs McKendry, who was 15-years-old at the time, said she was convinced that Mr Adams was involved, despite his repeated denials over the years. "I have always believed that Gerry Adams was involved in the murder of my mother. Till the day I die, I will believe that," she said. Ms McConville was dragged from her home in the Divis flats by an IRA gang in 1972 after was wrongly accused of being a British informer - becoming one of the so-called "Disappeared". Her body was eventually found on a beach in Co Louth in 2003. Mr McKendry said that she had already spoken to the police about her mother's killing although she had so far not named those she believed were responsible. She said that eight men and four women had been in the flat the night her mother was taken. One of the women had not covered her face in any way. Asked if she was prepared to tell police their names, she said: "Yes, I am prepared." Meanwhile, Northern Ireland's First Minister Peter Robinson has rejected claims from Sinn Féin that the arrest of Gerry Adams for questioning about the murder of Jean McConville was politically motivated. Mr Robinson said: "We want to have certainty that everyone who has been a victim of violence by the IRA or anyone else has the ongoing hope that justice might be done." Deputy First Minister Martin McGuinness described Mr Adams as the single most important person in bringing the peace process to where it is today. He said in that context he viewed the arrest as a "deliberate attempt to influence the outcome" of the forthcoming European and Local Elections. Mr McGuinness said: "That raises very serious questions about the agenda of those responsible. "There are people on the dark side of policing and this is an attempt to flex their muscles." British Prime Minister David Cameron said: "There has been absolutely no political interference in this issue". He said there is an independent judicial system "both here in England and also we do have one in Northern Ireland". Later Mr McGuinness said he has told Mr Cameron that there was no consistency on the part of the British state on the issue of "state killings". A statement issued by Sinn Féin said Mr McGuinness made the comments while speaking by phone to David Cameron tonight. Mr McGuinness said he supports and encourages the PSNI to pursue all and every investigation. "But I know that some investigations are pursued more vigorously than others". "I told the British Prime Minister David Cameron that in a phone call earlier tonight", Mr McGuinness said. “The families of the 11 innocent victims murdered in cold blood by the Parachute Regiment in Ballymurphy, the victims of Bloody Sunday and those killed in the Dublin/Monaghan bombings which the British government are still withholding information on to this day are testament to this reality", he said. Sinn Féin deputy leader Mary Lou McDonald this morning denied that Mr Adams is a suspect in the murder of Ms McConville. Ms McDonald said that Mr Adams had offered to cooperate with a PSNI investigation into the abduction and murder of the Belfast mother of ten in 1972. Mr Adams presented himself at Antrim Police Station by prior arrangement last night and was arrested. Ms McDonald also said her party feels very strongly that there is an element of political manoeuvring in the timing of the arrest. She said elements within the DUP and the Traditional Unionist Voice party had been looking for the arrest of Mr Adams. Ms McDonald said she believed they were doing this because they wished to exact a level of political damage on Sinn Féin and on Mr Adams. However, she said the questioning of Mr Adams is not surprising, as he had previously engaged with the PSNI on the matter. Mr Adams has rejected allegations made by former republican colleagues that he had a role in ordering the IRA killing. Taoiseach Enda Kenny was asked about Ms McDonald's comments in which she said the arrest of Mr Adams was politically motivated. Mr Kenny said: "The parties in the South have no connection with this at all. "The most important thing is that Jean McConville was murdered and her body was not found for years later." He said it is a murder case and the people that are the real victims are the family of Ms McConville. No one has ever been charged with the murder of Mrs McConville. However, after years without progress in the criminal investigation, there have been a series of arrests in recent weeks. A veteran republican, 77-year-old Ivor Bell, was charged in March with aiding and abetting the murder. Five other people have been detained and questioned. The recent police activity has come in the wake of a decision by a court in the US that compelled a university in Boston to hand over to the PSNI recorded interviews with republicans about Mrs McConville's murder. Boston College interviewed a number of former paramilitaries about the Troubles on the understanding the transcripts would not be published until after their deaths. However, that undertaking was rendered ineffective when the court last year ordered that tapes that contained claims about the killing be given to detectives. In the wake of the recent developments, Mr Adams, who has always denied membership of the IRA, said in March he would be available to meet detectives if they wished to speak with him. Mr Adams, 65, a former MP for West Belfast and now a TD for Louth, issued a statement minutes after the PSNI announced an arrest had been made. "While I have concerns about the timing, I am voluntarily meeting with the PSNI this evening," he said last night, questioning why police chose to interview him in the run up to elections. "As a republican leader I have never shirked my responsibility to build the peace. This includes dealing with the difficult issue of victims and their families. "Insofar as it is possible I have worked to bring closure to victims and their families who have contacted me. Even though they may not agree, this includes the family of Jean McConville. "I believe that the killing of Jean McConville and the secret burial of her body was wrong and a grievous injustice to her and her family. "Well publicised, malicious allegations have been made against me. I reject these. "While I have never disassociated myself from the IRA and I never will, I am innocent of any part in the abduction, killing or burial of Mrs McConville." A PSNI spokesman said last night: "Detectives from the serious crime branch investigating the abduction and murder of Jean McConville in 1972 have arrested a 65-year-old man in Antrim. "The suspect is currently being interviewed by detectives at the serious crime suite in Antrim police station." The IRA did not officially admit responsibility for Ms McConville's murder until 1999 when information was passed to gardaí. It was not until August 2003 that her remains were found on Shelling Hill Beach in Co Louth. Ms McConville's son Michael, who was 11 when his mother was murdered, has welcomed the arrest. He told the BBC: "We're just happy to see everything moving as it is moving at the minute. "Me and the rest of my brothers and sisters are just glad to see the PSNI doing their job. We didn't think it [Mr Adams's arrest] would ever take place, but we are quite glad that it is taking place. "All we're looking for is justice for our mother. Our mother, on the seventh of next month, would have been 80 years of age. "Although we didn't spend much time with our mother, we'd have liked to have spent a lot of time with her. If the IRA hadn't killed our mother, God knows, she still might have been alive today."